Update: 2nd June 2006: Added album and single artwork. - for full tour details, check muse.mu... there are just too many dates to keep up with!! Muse are also playing Meadowbank stadium in Edinburgh as part of T on the Fringe on the 24th of August 2006 - tickets on sale now! A Dublin date 3rd of November 2006 ad the Point Theatre and a couple of American dates have also been confirmed (check ticketmaster.com for details of the American dates). 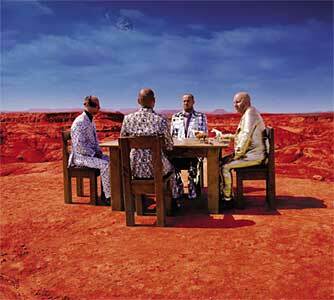 Muse have announced that their forthcoming album will be called 'Black Holes And Revelations' and is released on the 3rd of July 2006. 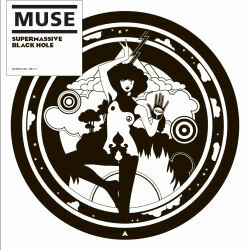 It will be preceded with the download single 'Supermassive black holes' released on the 9th of May 2006. The download single will contain artwork and a b-side (which is good news, it's one of my pet hates about download singles, generally no artwork and b-sides)! I knew it was too good to be true!! The CD/Vinyl/DVD version of the single will be released on the 12th or 19th of June (formats to be confirmed!). 3rd July - The album! We'll post the artwork and track listings when we get them! Muse are also playing radio 1's big weekend in Dundee, Scotland on the 13th May. Scroll down for a complete list of tour dates. 'There's a song on the album called "A Soldier's Poem", written from the perspective of a soldier, who kind of thinks "I'm out here risking my life, for what? "', he said. Bellamy added that themes of impending apocalypse also visited on "Absolution" are more specific this time round. "There is a theme on the album, it's that kind of connection to the cycles of history where the tension builds up and then it's released. Whether it's catastrophic like a nuclear war, or whether aliens come down and it's brilliant, but there's definitely a sense that something big is about to happen." Read the full thing here, you can find a more detailed interview in this weeks NME (15th March '06 issue). do they think to come to Turkey? I don't think they have any plans to play turkey, but i'l not really the one to ask. Ece, i was wrong, they're playing istanbul on the 2nd of september at the "Rock N Coke Festival". got tickets in november but want 2 no who is openin for them! can any1 help? Heyyy!!! Have tickets for the gig in Dublin in Novemeber, anyone know who's supporting?? Can't find it anywhere!!!! Thanx! I haven't seen anything yet... when i do i'll be sure to post it on the news page! Incase you haven't seen it 'The Noisettes' are to support muse on the upcoming arena tour. Im Very2 delighted wHen I heared ur New ALbum.,, mainLy is STARLIGHT.,.,FantAstic..!! 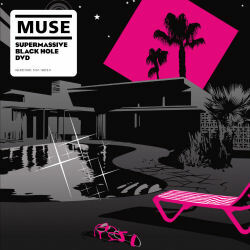 I likE The sOunds On tHat song and tHe aLBum.., BLACK HOLE AND RELAVATION.,!!!! I hoPe u could replay my messege.,.